During the procession to El Rocío town, each brotherhood carries its own Simpecado, a wagon with a representation of the Virgin Mary. In 2016 there was 117 brotherhoods reaching the town. 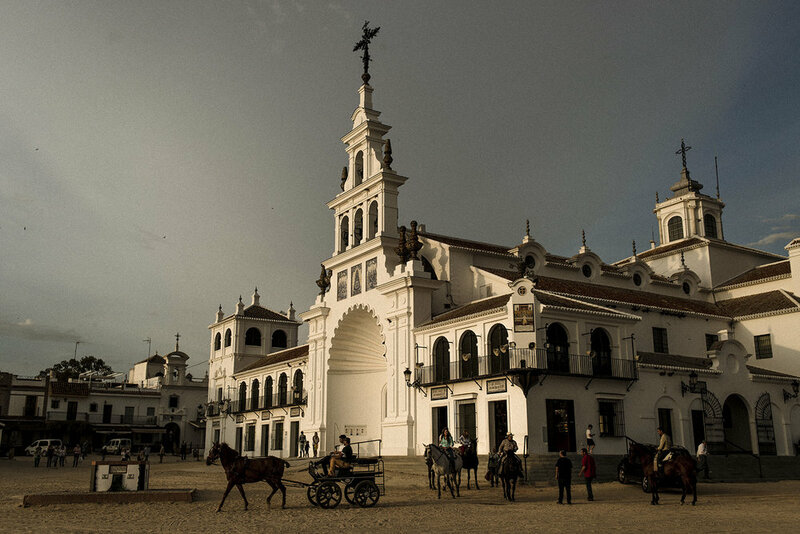 Huelva's brotherhood is considered the biggest one with approximately 14000 pilgrims. Hinojos, Spain, May 2015. The tradition of the pilgrimage is well attached to some families in Andalusia. For generations kids, parents, grandparents have been doing the procession together. An excuse to reunite families. Aznalcázar, Spain, May 2015. Each brotherhood has its own chief, El hermano mayor (Big brother) and someone carrying a drum setting the pace of the procession, El tamborilero. In the picture Chucena's town big brother (left) and drummer (right). El Rocío, Spain, May 2015. It is mandatory for the first timers pilgrims to receive a baptism during the cross of the river Quema, 25 km north of El Rocío town. Aznalcázar, Spain, May 2015. With lots of different routes being used by each brotherhood, one of the most famous is from Huelva's fraternity and its way thru Moguer. A route that takes them thru very sandy roads inside the National Park of Doñana. El Rocío, Spain, May 2015. 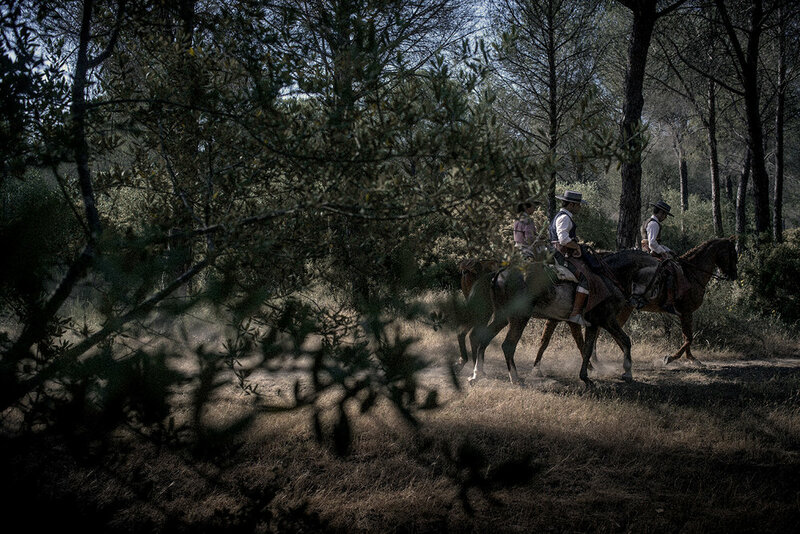 Most of the journey close to El Rocío takes place inside a National Park or protected areas. Only few cars are allowed by each brotherhood. Horse riding is a common way to reach the town. Pilas, Spain, May 2015. During each pilgrimage route there are known spots were pilgrims rest and perform dances, religious offerings or collective singing. A mix of South Spain folklore and religion. Hinojos, Spain, May 2015. The Quema river is a well know spot of the north route to El Rocío town. Here horses and people rest during the warm hours. Aznalcázar, Spain, May 2015. Traditional costumes are seen almost in every pilgrim. 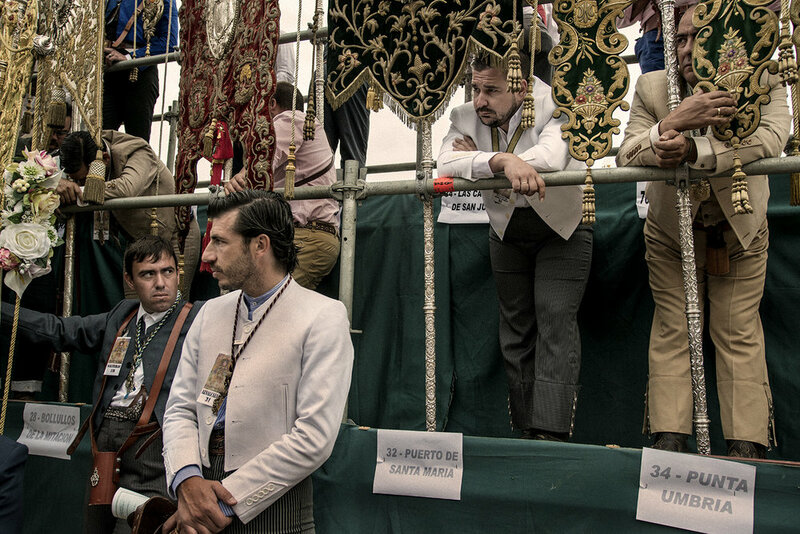 The typical South Spain costumes of Sevillana and Flamenca, mix with a no car policy inside El Rocío Town, with its no paved streets and full of horses takes the atmosphere of the pilgrimage to past centuries. El Rocío, Spain, May 2015. The hermitage of El Rocío days before the pilgrimage starts. With an all-year population not reaching 1000 people this village increases to nearly a million people during the week of the procession. El Rocío, Spain, May 2015. Each brotherhood has its own committee in charge, usually the ones carrying decorated metal batons. As each brotherhood arrives to town they have to offer their respects to the Holy Mary. The big square in front of the hermitage serves as stage of the offerings. El Rocío, Spain, May 2015. In front of the hermitage of El Rocío there is a small chapel with a representation of another Virgin Mary of El Rocío. This smaller representation gives the pilgrims the right to touch it as the original is being kept inside the main hermitage. El Rocío, Spain, May 2015. Each brotherhood's "simpecado" wagon has to be carried in front of the hermitage to venerate the Virgin of El Rocío before Sunday's big ceremony. Despite the sandy roads and the high temperature most people doing the procession is wearing traditional andalusian costumes. El Rocío, Spain, May 2015. 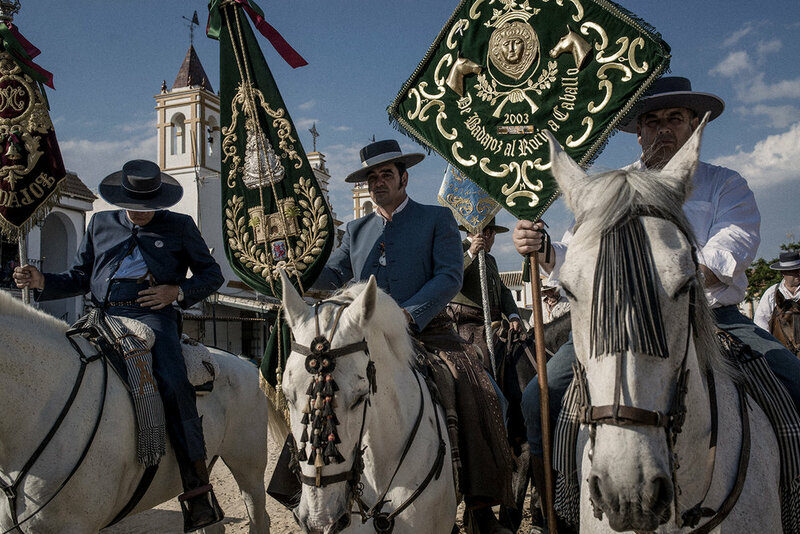 The procession to El Rocío is seen as a true Spanish folklore, as flamenco or bull fighting. A statue of the bullfighter Pascual Márquez in Villamanrique town, 24km north of El Rocío, a mandatory stop during the pilgrimage. Villamanrique, Spain, May 2015. The Badajoz's brotherhood did an almost 200 km journey to town. Some start the procession one or two weeks before the Pentecost Sunday. Apart from Spain, there is also El Rocío brotherhoods in Brasil, Argentina or Australia. El Rocío, Spain, May 2015. One of the highest points during the pilgrimage is the Sunday's Pentecost Ceremony in the town's biggest square. A ceremony presided in 2015 by José Vilaplana, Huelva's bishop. El Rocío, Spain, May 2015. In Sunday's ceremony a person from every brotherhood holds its banner during the almost 3 hour church service. The participation of each brotherhood has to be approved by the main brotherhood of Almonte, the ones in charge. El Rocío, Spain, May 2015. An inside view of a bar in El Rocío decorated with various catholic iconographies. Despite being inside one of the biggest National parks in Spain, Doñana, this town focus all of its tourism during all year around religion. El Rocío, Spain, May 2015. Almost each brotherhood doing the pilgrimage has its own priest with them. As the journey can be few days long, priests usually officiate ceremonies every morning during the travelling. El Rocío, Spain, May 2015. The next day after Pentecost's Sunday the brotherhood of Almonte exhibits the original Virgin Mary of El Rocío. An almost 12 hour non-stop parade in which people fights to touch or carry the statue. El Rocío, Spain, May 2015.